Lauren’s Musings: Will Your Marriage Last? 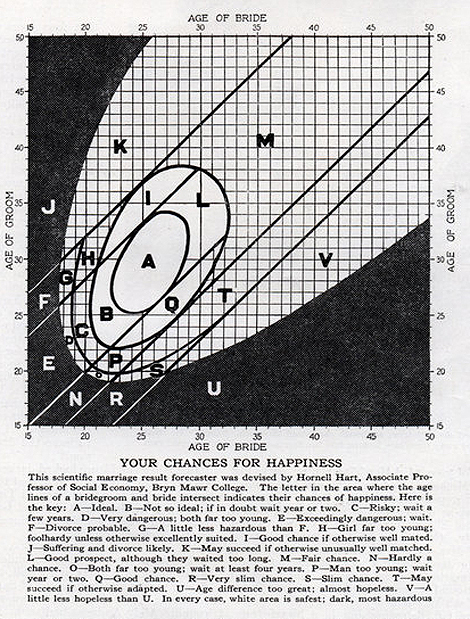 Jezebel posted a chart that was originally published in the October 1927 issue of Popular Science Monthly. Based on the analysis of over two thousand American marriages, the chart, devised by Hornell Hart, Associate Professor of Social Economy, Bryn Mawr College, is supposed to tell you the odds of a marriage being successful with the ages of the bride and groom being the predictors. "Those conclusions, reached after four authoritative investigations, show that marital happiness depends to a large extent on the ages at which couples marry; that from the age of the bride and bridegroom at marriage it is possible to forecast the future fortunes of the union with surprising accuracy. Age at marriage, of course, is only one of the factors affecting marital success. The physical, mental and emotional characteristics of the man and woman, not to mention financial and social conditions, play a part. But the investigations show age is a big factor." In case you're curious about the likely success (or failure) of your own nuptials, I've included the chart below, along with the legend that goes with it.